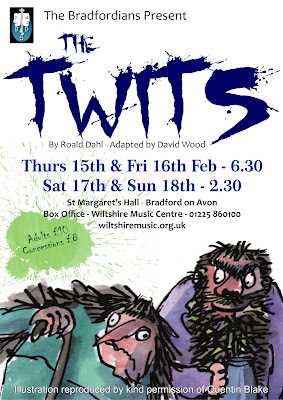 The Twits are coming to St Margaret’s Hall! Spring show will be Roald Dahl’s ‘The Twits!’ dramatised by David Wood. Come along to see just what shocking tricks Mr & Mrs Twit are planning for each other. Will Mr Twit really eat his ‘moving’ spaghetti! Will Mrs Twit really fly so that she can be stretched? Can you help the Roly Poly bird to rescue the poor Mugglewump family of monkeys from the dreadful Mr & Mrs Twit so that they can return to the jungle? Following the great success of ‘The Witches’ and ‘Revolting Rhymes’, this Roald Dahl classic is bound to be just as popular with the whole family. Wonderful characters – lots of stage magic, and fun for all. Tickets are £10 for adults and £8 concessions.